Abhinandan Varthaman, the hero pilot who downed the Pakistani F-16 warplane during the aerial dogfight in February, has joined the ruling Bharatiya Janata Party (BJP)? Twitterati has, yet again, fallen victim to another fake news ahead of Lok Sabha elections 2019. The Wing Commander is still a serving personnel of the Indian Air Force (IAF), which along with all other units of the armed forces, remains apolitical. Following his valorous return from Pakistan, Abhinandan turned into a revered figure, with scores of people across the nation spotting hairstyle, moustache and beard akin to him. One in Two Indians Receiving Fake News Through WhatsApp & Facebook Platforms Ahead of Lok Sabha Elections 2019. 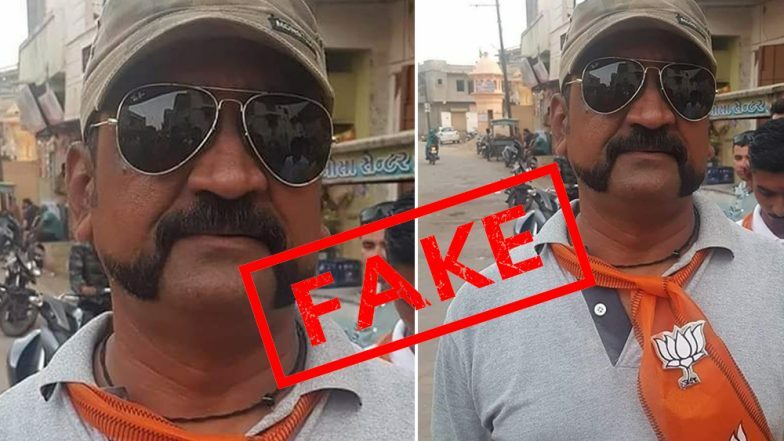 Images of the Abhinandan-lookalikes have allowed fake news peddlers to run another campaign on the social media, in an apparent bid to influence voters ahead of the general elections. The propagandists also use WhatsApp, another mass medium, to spread the factually baseless claim. The fake news on messaging application finally reached a retired personnel of the armed forces. Group Captain (Retd) Christopher reached out to the communications wing of the IAF on Twitter, and asked the Air Force Media Department to act against the miscreants. LatestLY urges all our readers to remain cautious of news being spread on social media platforms. While fake news is a year-long, ever-green menace, the politicisation of armed forces ahead of the elections is a much more serious issue. Abhinandan Varthaman has joined the BJP? Fake news being spread using a look-alike's image.